Open cans and drain off excess water. Do not be tempted to use this "turkey juice" to cook the rice as it is too high in salt. Place turkey in a freezer bag, cover with cold, fresh water, seal and place in refrigerator over night. Drain the turkey meat and squeeze out all extra water to eliminate as much salt as possible. Bring 2 c. chicken stock to a boil. Chop turkey into small cubes (approx. 1" x 1/2"). Place turkey in the boiling stock, reduce heat to low/simmer, and cover. Let the turkey simmer for 15 to 20 minutes, then remove from heat. Let cool. Place 1 3/4 c. + 2 tbsp. chicken stock and brown rice in a pot. Place on the stove on HIGH and bring to a boil, uncovered. Put the lid on the pot and reduce heat to minimum/simmer. If your pot has a steam valve, keep it closed. Let the rice simmer for 20 minutes. Remove from heat. Leave the lid on the pot and let rice rest for another 20 minutes. Remove the lid and let the rice cool. Preheat the oven to 150F or - you can use a food dehydrator for this. Chop turkey into very small pieces (you can use a food processor or a knife, or Mom got a really geeky kitchen tool for Christmas but it actually worked really well for this. It's a Slap Chop. Yes my Mom has one of those stupid "As Seen on TV" tools, but man...it actually works great!) You want the turkey to be in very small flakey pieces. Mix cold turkey, cold rice and egg whites together in a bowl and mix thoroughly. Line two baking sheets with parchment paper. If you are using your dehydrator, there is no need to line the trays. 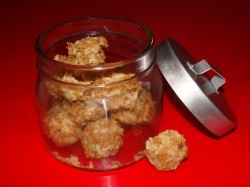 For medium sized treats - use a miniature meat ball tool to scoop out the mix. For small treats, use a melon baller to scoop out the mix.